Kate Leeming, 22, from Skipton is an Agri-Food Marketing with Business Studies student and a recipient of the Butchers’ and Drovers’ Charitable Institution. “I come from a dairy farming background and I have always been passionate about food and agriculture. 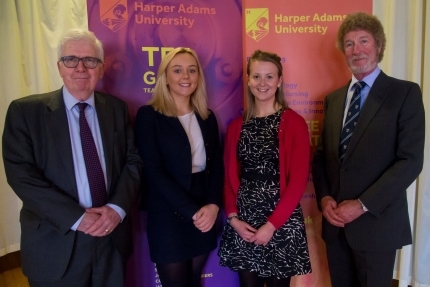 The Agri-Food Marketing with Business studies course at Harper Adams University seemed a perfect fit for my interests and knowledge and I am now in my final year having thoroughly enjoyed all aspects of my course. I am incredibly grateful to the BDCI for offering this bursary to me. I am a final year Harper Adams University student studying BSc Agri-Food Marketing with Business Studies. Upon receiving the award in 2019, I plan on investing the money in some Hereford cattle, with a view to rearing them, getting them in-calf and selling them prior to calving. Having the opportunity to do this with the bursary money will allow me to gain first hands experience of owning my own cattle and further my understanding of the beef industry. I completed my placement year in industry with Co-op and ABP and I had the opportunity to further my knowledge about the beef supply chain. Harriet Noble, 23, from Hebden Bridge, West Yorkshire is a final year Agriculture with Animal Science student and recipient of the Butchers and Drovers Charitable Institution Bursar. “Growing up on a beef and sheep farm in West Yorkshire meant that much of our production was focussed on the livestock and meat trade, igniting a passion for livestock farming in me from a young age. The Butchers and Drovers Bursary Award allows an opportunity for livestock orientated students like myself to pursue a career in the meat trade upon graduation from Harper Adams University. This bursary will allow me to undertake the qualifications required to make me more employable, for example artificial insemination qualification, towing trailer license and foot trimming. During my placement year, I used some of the money from the bursary to purchase 20 Texel X breeding sheep, of which the lambs were finished on our upland farm and sold through our family butchery business, and the breeding ewes were then sold on as I prepared to return to university. This allowed me to gain knowledge of the meat supply chain, some of which I will use in my future career.